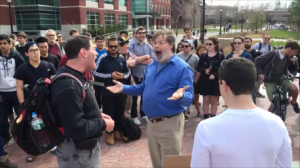 As previously reported, James Boster, Professor of Anthropology at University of Connecticut, spent over two hours attempting to draw students away from several evangelists that were open-air preaching and distributing gospel literature on campus. Evangelist Don Karns of Hampton, Virginia told Christian News Network that Boster approached him as he was holding a sign about evolution and became condescending and confrontational. Minutes later, Boster also began to heckle campus tour coordinator Scott Smith of Schoolmaster Ministries of Raleigh, North Carolina as he preached. Karns states that Boster then confronted him a second time, using profanity and likewise coming closely to his face. Andrew Rappaport of Striving for Eternity Ministries in Jackson, New Jersey witnessed Boster as he began presenting a speech in an attempt to stir up the students. “He started to address the students as ‘My brothers and sisters of Darwin,’” he recalled. “I want you to join me in saying, ‘Praise Darwin!’” Boster declared, as the students echoed his refrain. “Amen!” he proclaimed. 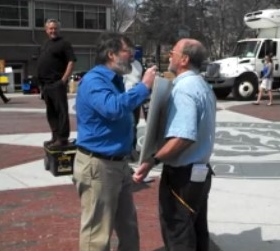 Boster yells at evangelist Don Karns as he holds a sign decrying evolution. Rappaport explained that as he began preaching, Boster again became agitated, and at one point began shouting in Polish. But in an email to Christian News Network, Boster defended himself against allegations that his behavior was inappropriate. However, in response to Boster’s comments, Smith told Christian News Network that there was no specific discussion about sexuality. UConn officials also released a statement about the matter, outlining that despite his disagreement with the message, Boster’s actions were unacceptable. The evangelists said that they hold no ill will against the professor, and realize that many reject the biblical message of repentance from sin and faith in Jesus Christ. “We obviously care about this professor and the students at UConn, and we long for them to find the liberty and freedom from sin in serving Jesus,” Smith stated.